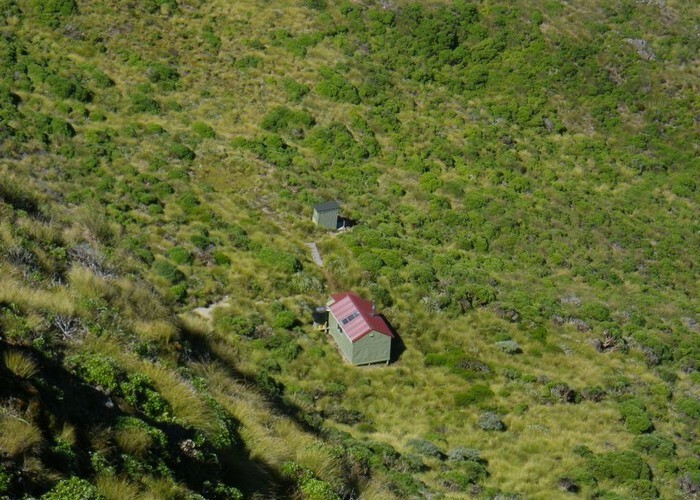 Nichols hut - a pleasant, recently renovated 6-bunk hut in the mid Tararuas. It lacks the coast views of Andersons, but has great views down the Waiohine valley towards the Wairarapa. It also receives a lot less traffic than Andersons - mainly fly-in hunters and Te Araroa walkers. Nichols Hut • By madpom. Licence: C.
Dracophyllum Hut: Track, 5km, 1.5-3hrs through cloud forest along main range. Parks Forks: Route (with unofficial markings) from knob east of hut to Parks Forks on Waiohine river. Onward routes to Carkeek Hut, Dorset Ridge Hut and McGregor Biv. Added 21 June 2011 by iangeorgeiangeorge. 3 revisions, most recently 20 May 2013 by madpommadpom. 239 views in the past year (20 per month).